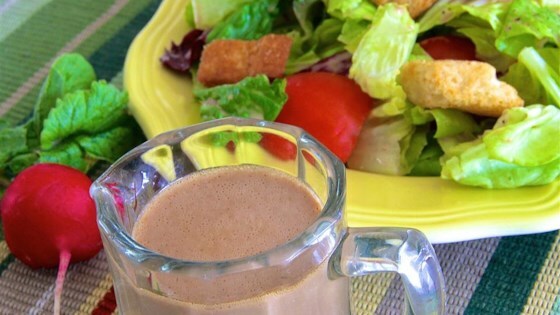 "This recipe is so quick, easy, and versatile, you may never purchase bottled dressing again. A variety of herbs and spices can be added to suit your personal taste." Blend olive oil, balsamic vinegar, mayonnaise, water, garlic, Dijon mustard, and brown sugar together in a blender or in a cup using an immersion blender until smooth. Season with salt and black pepper. This tangy dressing uses white balsamic vinegar for a smoother taste. Watery and too much sugar. Next attempt, skipped the mayo and up'ed the dijon mustard to 3 tablespoons, pureed 3 garlic cloves with 1 tbl rice vinegar. absolutely perfect! I did take out the water plus cut the mayo, mustard and brown sugar to half. It was great! Thank you for the recipe! Not too sweet and just the right amount a zest. A family favourite! Excellent....used 2 tbsp greek yogurt and 1 tbsp mayo instead. And, didn't have Dijon so used spicy brown mustard instead and still came out great.